This Cajun Crawler chair is as smooth in motion as a Segway, and it does it without using big wheels. The Cajun Crawler uses lots of little legs. Here's a still frame of the Cajun Crawler used as a chair. I can't confirm this, but the Cajun Crawler seems to be based on the same motion principles as Animaris Percipiere: Walking Robotic Sculpture Stores Wind Energy of Theo Jansen. 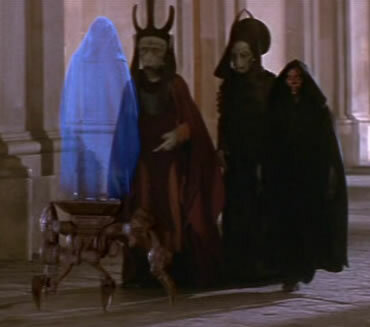 SF fans are inevitably reminded of the robotic chair from Star Wars: The Phantom Menace. And don't forget Humma Kavula's legs from movie version of The Hitchhiker's Guide to the Galaxy. 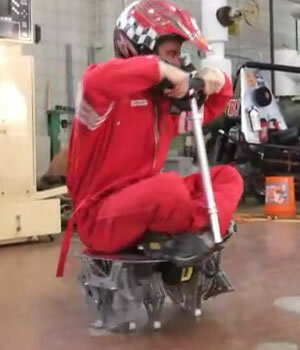 See also this spider robot chair demonstrated in Japan in 2008. I also liked the Bipedal HUBO FX-1 robot chair.